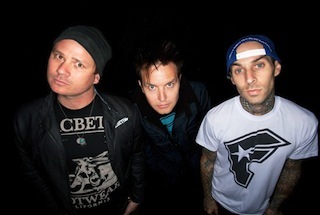 Blink-182 have confirmed in a new interview that they are still planning on releasing a new album in 2014. The band also reveal they have recently been meeting with various producers and record labels, but are still open to the possibility of self-releasing their next full-length. "So next year there will be a new record? Do you have a producer? Hoppus: No. We're talking about it but we haven't decided on anyone yet. This whole tour, this whole experience is about getting ready for that next record. We've been meeting with labels, we've been talking about producers, trying to figure out internally what the plan is for Blink. Do you think you'll go to another big label? Hoppus: I don't know. We're keeping our options open. We're meeting with some labels. DeLonge: We're not against it. Hoppus: We're not against it. If it's the right label and the right partnership and the right vibe or we could do it ourselves or use a distributor. There are so many options for bands now. DeLonge: There's not just like be completely independent or be on a label. There are many shades of grey so you can use labels for parts of what you need or you can hire services. It's a lot of options. We're not opposed to any of them."